Convenience stores aren't the dark, dusty places of old. These locations offer fresh grab-and-go, healthy food, tasty coffee and space to meet the neighbors. It was Rachel Krupa’s love for convenience stores that made her want to change them. Krupa grew up going to local convenience stores for the essentials and snacking at rest-stop convenience stores on road trips. Years later, when her diet focused on good-for-you foods and her work in public relations had her representing progressive, up-and-coming food brands, she realized that convenience stores needed an upgrade. In April of this year, Krupa opened The Goods Mart in Los Angeles. Krupa’s convenience store is among a handful of new businesses shaking up the traditional convenience store and focusing on healthy, high-end, products from small brands. Like a 7-Eleven, Krupa sells a lot of coffee and slushies at The Goods Mart’s self-service bar. But the coffee is from La Colombe, a Philadelphia-based roasted with responsible practices. And the slushies are organic and come from Kelvin Slush Co., a Brooklyn, New York-based company. 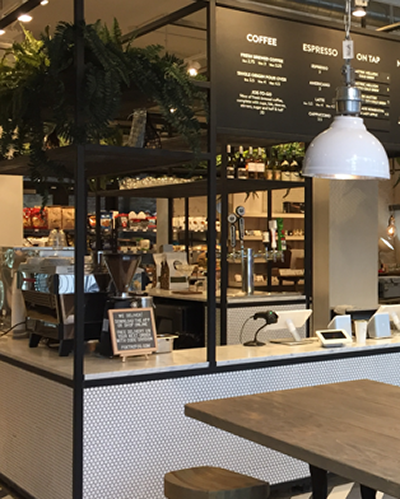 At Foxtrot, with five locations of its elevated convenience store in Chicago, Illinois, co-founder Mike LaVitola said, “Coffee is definitely a big driver for us and it always comes down to coffee, wine and ice cream.” Foxtrot locations have a “coffee shop vibe” with about a third of the store dedicated to coffee service, a third to chairs and couches for customers to hang out in, and a third for shelves and more traditional retail. Chicago’s Foxtrot stores originally started as an online delivery service for convenience items such as craft brews, wine and snacks. Fogarty’s business was inspired by growing up near East Coast-based Wawa convenience stores and spending time in Europe, where small-format grocery stores are popular. Although Choice Market and The Goods Mart only have one location each, they have ambitious expansion plans. Krupa would love to open more locations in L.A. before moving on to her home state of Michigan. Fogarty hopes to have five stores open by the end of the year in Denver and other markets. After nearly four years in operation, Foxtrot has cornered the corner-store market in Chicago by focusing on locations on the main street of different neighborhoods in the Windy City. But the business originally started as an online service delivering “what people typically go to the convenience store for, which for us is craft beer and wine, great snacks, that kind of stuff,” LaVitola said. Denver-based Choice Market’s product mix is about 90 percent better-for-you and 10 percent traditional c-store and CPG. “We approached it by taking all the things people typically buy from the corner store or convenience store and we’d find the best version of those [and] really try to update the menu with a focus on quality and local and interesting, emerging brands and then deliver it in under an hour,” he said. LaVitola soon discovered that he needed a brick-and-mortar location to deliver alcohol legally. But to his surprise, the retail stores grew along with the online business. “I think customers have really low expectation of what a convenience store is, and so, when you have a really fun and bright and welcoming one that has really high-quality products that they're not used to seeing, they get excited,” said LaVitola. “It wasn't a hard sell from a consumer point of view.” The company is planning to open a few more Chicago locations in the next couple of months before expanding nationally. Bridges General, which opened its first location in May 2017, already has locations in different markets. The convenience store concept is part of Retail Worx, a company with seven brands in the health and food space. Bridges General, wich has locations in California and New York, and mainly focuses on real estate in commercial office buildings, with and without public access. Bridges General locations are highly designed spaces offering carefully curated products in snack foods, drinks and grab-and-go, as well as toiletries, cards and small gifts. With its services and products, Battista sees Bridges as a boon for customers and landlords alike. Learn more about online grocery shopping/delivery and meal solutions at the inaugural SN Summit, held Oct. 1-3 in Dallas, the only conference where food retailers and restaurateurs learn from each other.